Starting with BizTalk Server 2016 Feature Pack 1, send tracking to Power BI using the Power BI template provided, or create your own. Operational data is information on the instances and messages flowing through your BizTalk Server environment. The operational data feed is the same data you get looking at Group Hub in BizTalk Server Administration. The data is accessed and queried using visualization tools, including Power BI. PowerBI.com is a great resource to understand and learn more about Power BI. Install IIS on the BizTalk Server. In most BizTalk Server environments, IIS is already installed. See Hardware and Software Requirements for BizTalk Server 2016. Confirm IIS is installed by opening Internet Information Services Manager. Optional. Install and configure a Power BI Gateway to connect PowerBI.com with your on-premises BizTalk Server. If you're not using an on-premises BizTalk Server, then you don't need the gateway. Run Windows PowerShell as Administrator (Start menu, type PowerShell, right click, and select Run as administrator). Go to the BizTalk installation folder (for example, type: cd 'C:\Program Files (x86)\Microsoft BizTalk Server 2016\'). WebSiteName: The existing IIS web site that hosts the service. The default value is Default Web Site. ApplicationPool: The Application Pool used by the service. If it exists, a new one is not created. The default value is DefaultAppPool. ApplicationPoolUser: Configures the application pool to run as this user identity. Must have BizTalk Server Operator, or higher privileges. To confirm it’s working, browse to http://localhost/BizTalkOperationalDataService. If you are prompted to sign-in, sign in with an account that is member of the domain\group you entered in the previous step (-AuthorizationRoles 'BOOTCAMPBTS2016\BizTalk Server Administrators'). If you are prompted to open or save BizTalkOperationalDataService.json, then your install completed. You can save it locally, and then open it in notepad or Visual Studio to see the contents. Open Computer Management, and expand Local Users and Groups. Select Groups, and scroll down to the SQLServer… groups. 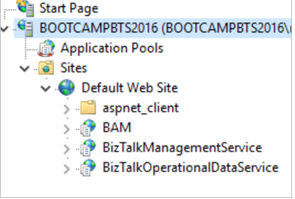 In the following example, notice BOOTCAMPBTS2016 is in all caps. If you see all caps, then enter the computer name in all caps. Download and install the Power BI Desktop on your BizTalk Server. You can select to open it, which is optional. If you have a work or school account, you may have access to Power BI. Try signing in with that account. Or, you can try it for free after signing up. Select Load. 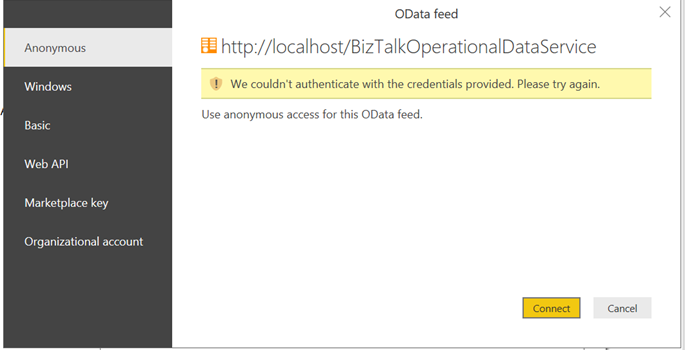 The window loads and connects to the different oData sources in the BizTalkOperationalDataService.json file. When it completes, the dashboard shows details about your environment. If you get couldn't authenticate with the credentials provided message similar to the following, then it’s possible your application pool identity doesn’t have enough access to the BizTalk Server databases. You can change the appPool identity within IIS to an account with more privileges, maybe your signed-in user account (which has local admin privileges). The Guided Learning is also a great place to learn more about Power BI, and all the things you can do.